A Queensland MP has criticised the state Government’s planned changes to abortion laws at a pro-life rally outside Parliament on Saturday. Source: Brisbane Times. Christian Rowan, the LNP member for the Brisbane seat of Moggil, claimed the parliamentary committee process was flawed and the Queensland law reform commission was not impartial to its assessment and recommendations. “To decriminalise and remove termination of pregnancy from the criminal code ... is an abdication of responsibility of any government to the welfare of its citizens and future generations,” Dr Rowan said. The former girlfriend of ex-NRL player Tim Simona, Jaya Taki, made an emotional speech at the rally. She said Mr Simona had forced her to have an abortion when they were still together. Ms Taki said she regretted the decision to have an abortion but felt she had no support. “I (had) heard that there was a possibility that if the counsellor at the clinic found you unfit for abortion, you could not have one so I thought it was a safeguard,” she said. Ms Taki said the counselling session lasted minutes. The Government’s bill will be debated in Parliament this week and would allow terminations on request up to 22 weeks., create safe access zones and a requirement for doctors who conscientiously object to refer patients to another medical professional. Meanwhile, the annual March for the Babies rally took place in Melbourne on Saturday, 9news.com.au reports. The march comes 10 years after the Victorian Government legalised abortion in the state. 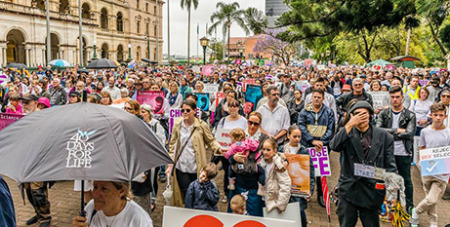 “As a result of that, over 200,000 babies have been killed in Victoria over the last decade and we want that to stop,” Liberal MP Bernie Finn, the president of the March for the Babies, said.